For the next few weeks, as part of the #5WomenArtists campaign, we're discussing areas of the art world that women artists are leading the way in defining what this type of art means in a contemporary context. Each week, we'll dive into a different area and pick five women artists we love that explores it in her work. This week, we're looking at women who create work about domestic life. Mychaelyn Michalec is an emerging artist whose paintings depict ultramodern matters of domestic life. The mundanity of many of her scenes makes them feel unnervingly intimate, while others have a subtly tragic weight of showing families and lovers in close physical proximity while being emotionally distant. Often, someone's attention is pulled away by technology as they check their phone or watch TV, or is simply lost in thought. As abstraction fights for space within the plane, sometimes encroaching on the figurative, it mirrors how these small scenes might fade away or blur together, not quite significant enough that they will be remembered in exact detail. It is both an embrace of and resistance to domesticity. Tracy Miller's exuberant paintings that meet at the intersection of still life and abstraction are amplified by bold colors, a Pop sensibility, and a tongue-in-cheek sense of humor. All of these characteristics have also largely been dismissed as unrefined, just like the connotations of femininity when centering your work on the domestic, but Miller leans into them. The chaos of the abundance of information in each painting is grounded by masterful composition. It's a frenzy of markers of consumerism and the illusion of a dignified proper home life, a balance between decadence and guilty pleasures. 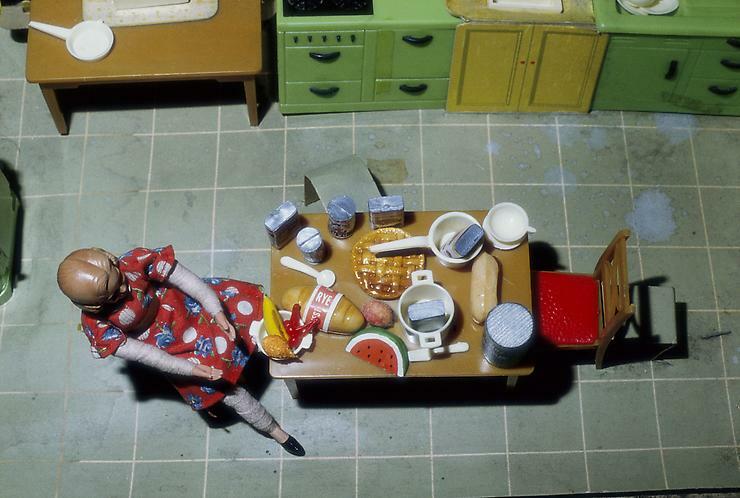 Laurie Simmons builds rooms out of antique dollhouse accessories and her own constructions, then photographs eerie off-kilter scenes that take place in them. In her early works, a single doll of a housewife going about her typical daily duties was cast in a light and from angles that emphasized the claustrophobic loneliness of women allegedly living the American Dream. More recent works employ paper cut-outs of more glamorous women socializing and entertaining. Again they are supposed to be living the ideal life, but the evident fakeness of the imagery and absurdity of the compositions reflect the facade that is so often the reality of these women's lives. Like actors on a stage or dolls in a dollhouse, they play a role on a set largely defined by a hand not their own. Adrienne Elise Tarver's multi-media installation, "Eavesdropping," takes a look at domesticity from the other side of the coin. It is not about one's own life within the home, but the curiosity and voyeurism of desiring to know about other people's private lives. Inspired by a photograph of an anonymous young black girl she found in a thrift shop, Tarver built an imagined world for her, filling in her story. She made her a home, cast in shadow and photographed in a way that always just removes the viewer from the heart of the room. The absence of a figure or even the hint of human touch lends a feeling of intrusion. In a video that accompanies the photographs, there is more of an illusion of a person: muffled voices, lights turning on and off, and shadows passing by windows gives us a sense that there is a life being lived here, but still doesn't reveal too much. It is an exploration of "the notions of insider, outsider, and other."